Add a touch of contemporary and style to your work area with the Ridgeley 3-piece Set. The pedestal features one utility drawer, one door and one file drawer with letter/legal filing system. One lock secure the file drawer. The edge and the handles feature a brushed nickel finish. The contemporary metal handle offers geometric lines and an uncluttered design. The hutch has two doors and 2 adjustable shelves that allow closed and open storage. The lateral file has two file drawers with letter/legal filing system and one lock that secures both drawers. 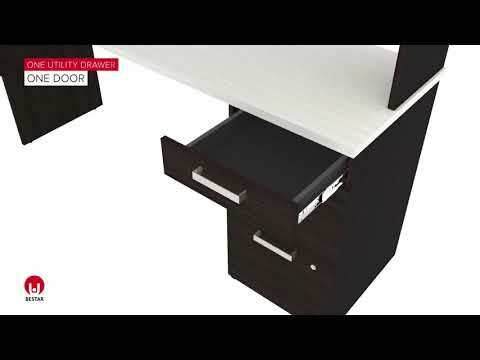 All the drawers of this set and the keyboard shelf are mounted on ball-bearing slides for smooth and quiet operation. Desk : 65“ x 93.6“ x 65.9“.